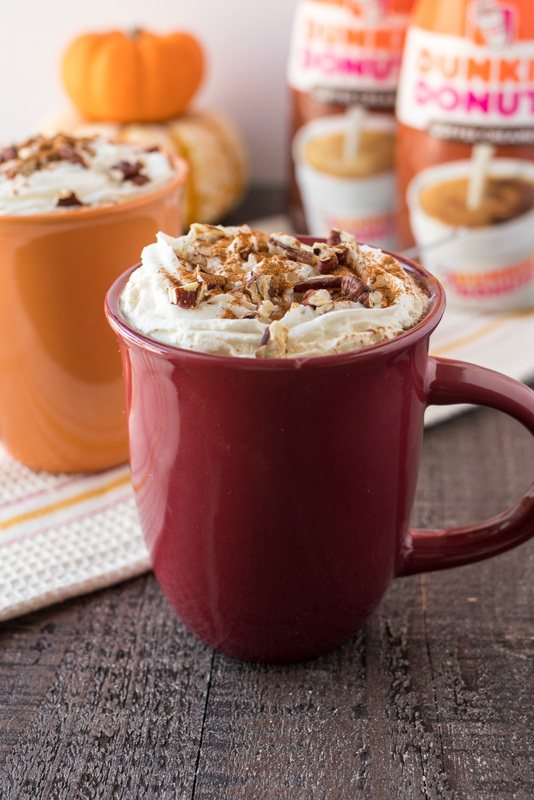 Cinnamon Maple Latte – Strong home-brewed coffee is mixed with a sprinkle of cinnamon, real maple syrup, Dunkin’ Donuts® Extra Extra Creamer, and then topped with whipped cream and roasted pecans. Just call this fall in a cup! Was that an overreaction? I’m just so happy to bust out my sweaters, turn on the fire in the living room, and bake pumpkin EVERYTHING. But my first recipe for you guys this season isn’t pumpkin-related (that’s for later this week). Nope, today’s recipe is about a flavor that has almost been forgotten this time of year: maple. Have you noticed that pumpkin has become so synonymous with the fall that almost no other fall flavors have their time to shine anymore? Apple cider may be one exception. But poor maple…you almost never see it anywhere anymore. I love the flavor of pure maple syrup. Add a dash of cinnamon and you have such a comforting combination of flavors. So can you guess what today’s recipe is yet?? Yup, that’s right – it’s a Cinnamon Maple Latte! Coffee has been an obsession of mine since I was a kid. Do you guys remember when I told you all about it in this post for my Tiramisu Frozen Coffee?? Well, here’s a little reminder – my grandma would bring me coffee candies from Colombia every time she visited. They were sweet little hard candies with the bold flavors of Colombian coffee. You’d think, as a kid, these flavors would be off-putting. But not for me! I would go through a whole bag of them in about a week. I credit these candies to starting off my coffee infatuation before I was even in my teens. Do you have a fun story about when you fell in love with coffee?? I’d love to hear about so let me know in the comments below! To make a latte, there are two basic components: espresso and steamed milk. Instead of espresso, I’m using strong coffee because it’s more accessible for me (and probably for you too!). The same goes for the milk – steamed milk isn’t something everyone can just make at home. So I’m using rich creamer instead. I wanted an extra creamy finish in this latte so there was really only one creamer that I wanted – Dunkin’ Donuts® Extra Extra Creamer. It’s extra creamy and extra flavorful and perfect to enhance this drink but won’t overpower it. We want the texture to come from the creamer but the flavor to come from the maple and cinnamon so this creamer is perfect for the job! Side note: I also looooove the Dunkin’ Donuts® Caramel Creamer to jazz up my weekday coffees when I don’t have time to make anything fancy. I always wake up craving something sweet so this creamer has the rich, caramel flavor that helps me start my day right. You can easily find these creamers at your local Walmart, in the dairy aisle. Make sure you mix the cinnamon and maple syrup together before adding coffee or Dunkin’ Donuts® Extra Extra Creamer. Cinnamon tends to clump when it’s added to lots of liquid so I like to mix it will a little liquid first and then add the rest of the liquid. Though lattes are made with espresso, this version is made with brewed coffee. Feel free to use espresso, if you rather. But make sure to add a little more Dunkin’ Donuts® Extra Extra Creamer to help balance out the intense espresso flavor. And there you have it – the first official recipe for fall. I hope you love this Cinnamon Maple Latte as much as I do. If you need so more ideas of how to spice up you coffee routine, check out these other ideas for #DunkinCreamers. Strong home-brewed coffee is mixed with a sprinkle of cinnamon, real maple syrup, Dunkin’ Donuts® Extra Extra Creamer, and then topped with whipped cream and roasted pecans. Just call this fall in a cup! Add maple syrup and cinnamon to a coffee mug and stir until combined. Add Dunkin’ Donuts® Extra Extra Creamer and stir. Fill mug to the top with hot, brewed coffee. Finish off with whipped cream, a dash of cinnamon, and roasted pecans. Mmm looks divine! And perfect for the fall season! This looks so delicious! I love fall drinks! Thanks, Marlynn! I love them too! this is the perfect fall drink!! it reminds me of a drink I tried at Tim Horton’s the last time I was in Canada. I love the flavor of maple and cinnamon! Thanks so much! Let me know how you like it! The topping alone looks amazing… someone get me a spoon! This drink gets me so excited for the Fall!! Looks AMAZING!!! This sounds sooo delicious! I used to make stuff like this all the time at home but haven’t in a while. Thank you for reminding me! Awesome! Glad you’re getting back into fun coffee drinks! I started drinking coffee regularly after baby #1. Sometimes for pleasure, sometimes for necessity. I have pumpkin spice latte in a bottle from target in my fridge now! Thanks for sharing your passion! And you’re making me want another cup of coffee! This looks so delicious! I love all the pumpkin! Oh, see now…this looks freaking amazing! Now I need to make another grocery store run! Okay this latte is amazing! I just tried something similar at Starbucks with crushed pecans and it was sooo good. We also drink Dunin Donuts at our house. Def going to try this! I usually just drink my latte’s plain, but I’ve been looking for a seasonal version to try, without going stereotypical pumpkin spice. Thank you for this version, it could even go into winter!